Asked about "globalization, especially the increasing connections of our economy with others around the world," majorities in six of the seven nations polled say that it is "mostly good" for their country. Approval is highest among Egyptians and Nigerian Muslims (79% and 78% saying mostly good, respectively). Sixty-three percent of Azerbaijanis, 61 percent of both Iranians and Indonesians, and 58 percent of Palestinians see globalization as mostly good. 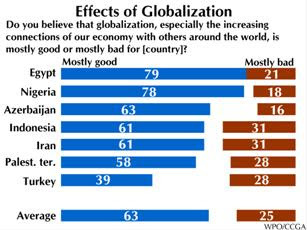 While support in Turkey does not reach a majority, a plurality still calls globalization mostly good (39% to 28%). On average across all seven publics, 63 percent say that globalization is good for their own countries. Only 25 percent think it is mostly bad.